Austin has been growing at an incredibly rapid rate, burgeoning with innovation and an influx of industry. However, real social issues and logistical problems accompany this growth. Dan Graham, founder of BuildASign.com, has set out to empower the community to solve today’s most pressing issues through his most recent venture, Notley. Notley is a catalyst for social innovation, working with today’s impact organizations and changing communities to unlock opportunities. Its mission is to fund and support businesses, nonprofits, and programs that are making positive change in the world, thereby creating a social innovation ecosystem in which purpose-driven organizations can thrive. Graham was born and raised in Austin and attended the University of Texas, earning an undergraduate degree in computer science and philosophy. "Unlike many of my compatriots," Graham says, "I enjoyed working with people, so I decided that I didn’t want to program for a living. I ended up at law school and did web development work with a couple of friends just to earn some bar money." Graham and his friends would get requests for basic websites and propose more complex and expensive solutions to the companies' business models. "But we weren’t very good at selling, so we had a lot of rejected ideas," he says. "BuildASign.com was one of those failed upsell ideas. Local printing companies would spend a ton of time in the graphic and proofing process. They would assign a graphic designer to a potential customer and go back and forth. And after like five touches, the customer might not buy at all or take the design and go to a different shop." This sparked an idea. "What if we build a photoshop-styled tool that was embedded into the website, and customers could design their own product or choose from a customizable template? Then you wouldn’t have to spend any money until they were ready to buy." Graham and his buddies took the website door to door to each Austin sign company. "We got rejected at every single place we took it because people didn't think anyone would buy stuff online. At least three or four places called it 'the intercom' instead of the internet." Businesses were trying to reduce costs, but the graphic designer that the model proposed to eliminate was usually a friend or a cousin, making their idea an even harder sell. The group decided to spend about $100 on Google AdWords to obtain customers, hoping someone would buy the technology, but there were no orders, and they decided to shelve the project. But a few months later, in the summer of 2005, someone from the middle of Illinois placed an order on the website. "We didn’t know how they had found us. The only thing we could guess is that they had come in during the few seconds of AdWords, so we actually looked into our account and realized we had been doing it completely wrong." It turned out that their advertising was targeting people who were looking for signs of pregnancy, or signs of the apocalypse. "Once we fixed that, we started to actually get a trickle of a few orders a week. But then we found ourselves in an awkward position. We weren’t a real company. Our website promised quick turnaround times and moneyback guarantees. So we went back to all of the sign companies that rejected us and said 'hey, I know you don’t want our website but can you help us with these orders?' We found a local company and outsourced everything to them for about two months." Graham was finishing his last semester of law school, and the print shop started getting all of its orders out late. "I drove out to talk to the owner," Graham says, "and he said 'look, I hate your orders.' They were these low-value, custom, one-off pieces. The shop’s customers had been with them for years, and they weren’t about to prioritize our orders over theirs, so he told us that if I wanted to get my orders out on time, we could hop in the back and get to work." So that’s what they did. The owner gave Graham and his friends a key to his shop, and they started coming in every day after hours and every weekend. "Depending on what we were printing, we'd take shifts sleeping on the floor to watch the machines. We’d bring anyone we were dating at the time or anyone we could bribe with beer or pizza to come and help us work." The bunch were just a handful of programmers, learning how to manufacture printed products. But in the last six months of 2005, while outsourcing everything, they made $250,000 in sales. Graham and his partners made the decision at the beginning of 2006 to buy a $20,000 printer, sign a lease for some space and go straight into the sign manufacturing business. "I was graduating, and I didn’t even take the bar exam," recalls Graham. BuildASign.com did just over $3 million of revenue in its first year and $8 million in its second year. The company now has around 600 employees, and in 2018 it will make well over $100 million in revenue. "I went kicking and screaming from the software space into the print manufacturing space," says Graham. "And it ended up being a great thing. The manufacturing process itself is probably our biggest competitive advantage. Pretty much anybody who gets into our space is either coming from the software side where they don't want to mess with inks and printers and stuff, or they come from the traditional sign world, where they don't know anything about web or online marketing, or how to convert customers online. So we kind of sit in this hybrid space in between, which creates a really nice barrier for competitors. We've really flourished in there." Easy Canvas Prints and Allied Shirts are other brands that BuildASign.com now operates. But perhaps the most crucial pivot point for Graham was the development of the BuildASign Giving Program, which would change the direction of his entire life. BuildASign.com’s products were in high demand from the nonprofit space. Nonprofits need banners, signs, and t-shirts, but they generally can’t afford them. Right out of the gate, charities began requesting items at a discounted rate. "We started out with a budget pool of money that we would just use for discounts or donations. And as word got out that we were giving stuff away, demand increased." So the founders of BuildASign.com found themselves in the difficult position of having to decide what to give away and which type of organizations they would give things away to. The types of organizations that qualify for 501(c)(3) status are very broad, ranging from churches to cancer research to hate groups. "Developing policies and decisions around that is tough," says Graham. "We had to build infrastructure around our nonprofit program and the interesting challenges that represented." They decided to onboard an intern and gave her the mission to develop the BuildASign Giving Program. "We began to implement a tiered sponsorship model. Really large nonprofits with large media budgets, let's give them a discount but still charge them something. And 100 percent of the profit that we make from those sales, we'll use to subsidize the small nonprofits that can't afford anything. And the extra cash can go toward employee matching programs or corporate donations, but it also has to cover [the intern’s] salary. The idea was, it could be neat if we could make a self-sustaining independent business unit, independent P&L, within the company. And she crushed it." The Giving Program quickly grew independent from the overall business. At its height, it had eight full-time employees focused purely on philanthropy and social enterprise ideas, such as the Troops Program, which gave away "Welcome Home" banners to families of returning military members. Graham has always wanted to give back. And he recognized that nonprofit organizations often encounter some of the toughest challenges and have some of the biggest needs, all while trying to solve the world’s most important issues. In Austin alone, there are 6,500 nonprofits and 7,000 vacant board seats. "I always wanted to tackle tough social challenges," says Graham. "Since there was a huge demand coming from the community for the products we were offering, we saw an opportunity to be entrepreneurial, creating a solution that provided products and cash to the community in a way that would culturally benefit the business. It felt like it'd be a fun, interesting project, offering a clever solution." This innovative solution changed Graham’s life. "It drove the next chapter for, me. We sold part of the business to a private equity firm about four years ago. In February of 2017, I transitioned out of the CEO role into an executive chairman role, and Bryan Kranick became the CEO." Graham and his wife, Lisa, began Notley, which is focused entirely around the intersection between entrepreneurship and philanthropy. "Notley is cultivating an ecosystem," says Graham. "We’re developing a hub of resources in order to help socially minded organizations to innovate solutions and scale for maximum impact." Notley consults nonprofits that want to operate more like a business in terms of strategies, earned revenue models, how they fundraise and build relationships, and leveraging real estate for a greater impact. Additionally, Notley invests in and works with for-profit enterprises that have a social giving component to their business model. Notley also runs a handful of other large program initiatives designed to expand impact. Philanthropitch is a fast-pitch competition that provides high-potential nonprofits and social enterprises with access to human and financial capital. Since its founding in 2013, Philanthropitch has granted over $900,000 to 50+ mission-driven organizations across 3 different cities and has supported them with coaching, exposure and access to an accelerator program. Another program that Notley operates is Startup Games. Startup Games unites high-growth startup companies in friendly competition to build great cultures while giving back to their local communities. Notley’s vision is to have the top startup communities in the world compete in an Olympics-style event, with the goal of raising $1 million per year for charity. Notley also recently began the Notley Fellowship, a program designed for young professionals and purposeful leaders committed to taking on challenges in the social sector. The first class of 22 Fellows was announced in May of this year. Recently, Student INC joined Notley’s family of social innovation programs with the goal to catalyze a robust youth entrepreneurship ecosystem in Austin to ensure that every kid has access to entrepreneurial education and experiences. With so much going on, what’s next for Notley? "The Center for Social Innovation," says Graham. 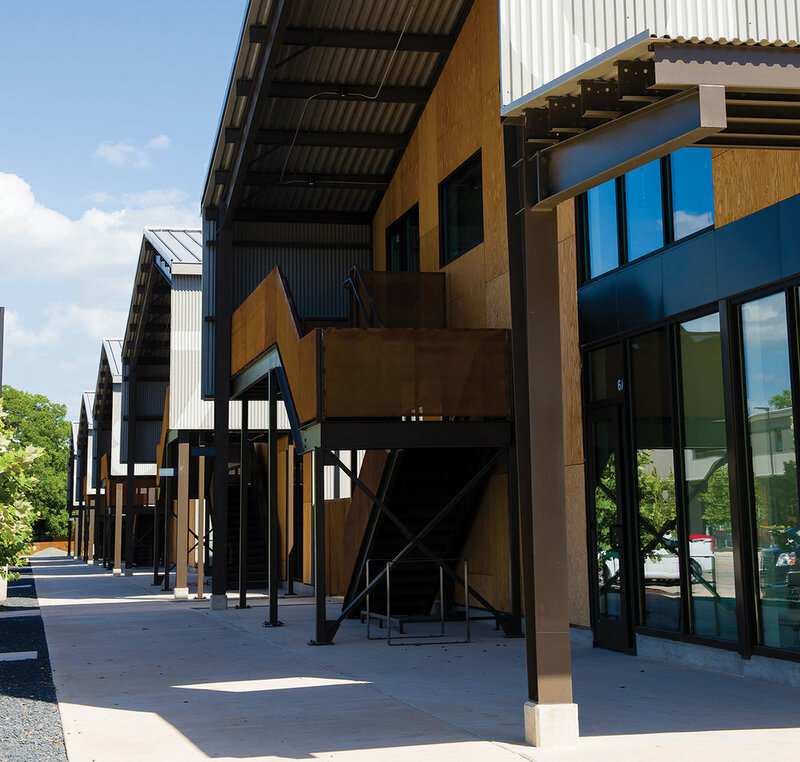 "The CSI is an integrative campus for socially innovative organizations, and it’s been designed to tackle long-term commercial affordability and serve as a permanent home for Austin's social innovation ecosystem. Together nonprofits, social enterprises, city innovation leaders, capital providers, incubators, accelerators, universities, and advocacy groups will gather and collaborate in the space to foster new ideas and create inventive solutions to our biggest challenges." Notley has partnered with Central Austin Management Group and Michael Hsu (the team behind Canopy) to develop 10 acres of property. The facility will span 165,000 square feet and 15 buildings, including 10,000 square feet of coworking space, 5,048 square feet of meeting space, and commercial and private office spaces. That 10,000 square feet of coworking space, Relay Coworking, is a new space for ambitious social entrepreneurs who are looking to create change in the world while surrounded by everything they need to make the impact they want. "Now we’re working to scale all of these programs into other cities," Graham says. "Every city has some of the same problems, and they approach them in different ways. If we build this ecosystem in Austin and find what works here, we can replicate these solutions through similar ecosystems across other communities around the world." Graham has been working hard to create the ecosystem, but he can’t do it alone. Now he needs you. Do you have an idea about how to solve a problem? Notley is looking for entrepreneurs like you to impact your community using the considerable resources that Austin’s social innovation network has to offer. Graham turned customizable sign manufacturing into a multimillion dollar business that supports hundreds of jobs. But the lasting impact that he’s made runs deeper than creating an incredible company, or even contributing considerable philanthropic dollars into our city. Graham has built an ecosystem that empowers community members to step into their power and effect great change. By surrendering to serve others, he has become one of Austin’s most powerful leaders, creating the vehicle that will enable progress and generate abundant, lasting change. Learn more about Notley at notleyventures.com.